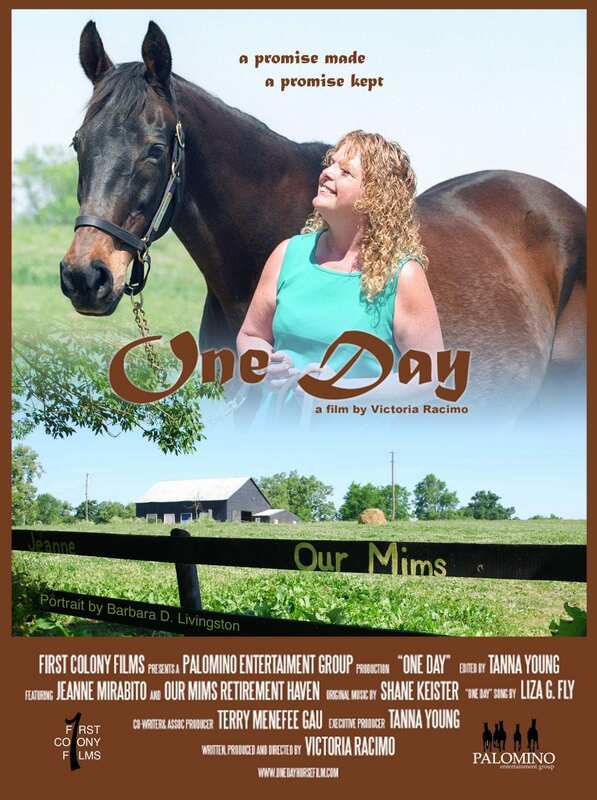 Palomino Entertainment Group presents the premier of its film, “One Day” on Friday, Oct. 9 at Equus Run Vineyards, Midway, Ky., as a Benefit for Our Mims Retirement Haven. “One Day” features interviews with Eclipse Award-winning photographer Barbara Livingston, Hall of Fame jockey Jorge Velasquez, and award-winning journalist Steve Haskin. The film's narration includes Emmy nominee Josh Charles (“The Good Wife,” “Sports Night,” “Dead Poets Society”). This is the true story of famed Thoroughbred Our Mims, the 1977 Eclipse Award Champion 3-Year-Yld Filly. A teenage Jeanne Mirabito falls in love with Our Mims when she sees her race on TV. Jeanne makes a “cosmic claim” on her and vows one day she will own her. Twenty-one years later, in the backfield of a cattle farm, fate brings them together. They form a bond and through that relationship, a horse rescue was born called Our Mims Retirement Haven (OMRH) where broodmares are given a forever home. OMRH is located in Paris, Ky.
“One Day” is directed by Victoria Racimo, founder of Palomino Entertainment Group. Victoria has an extensive career as actress, writer, and director. She produced the film “Casi Casi” and sold it to HBO, co-authored the recently-released book “Blue Moon” with Alicia Keys, and staged two theater scenes for Steven Spielberg in his film “Lincoln.” She starred opposite Charlton Heston in “The Mountain Men” and in Disney's “Ernest Goes To Camp,” among many other credits. Editor and executive producer TanNa Young, is coordinating producer on the CBS hit series, “The Good Wife”. Palomino Entertainment Group is a multi-faceted film, television, and theatrical production company. PEG produced the film as a gift to OMRH to raise awareness and support for the horses at the Haven. “One Day” will also be used as an educational tool about issues surrounding horses that no longer earn money on the track or in the breeding shed. Reception is at 6 p.m. Screening at 7:15 p.m. Tickets are $50 for adults, $25 for 17 and under. Key sponsorship of this benefit is provided by Broadway Stages NYC and the Kennedy Family Trust with in-kind support from Equus Run Vineyards and Catering by Donna. This entry was posted in Horse Care and tagged Catering by Donna, Film Premier, kentucky horse park, One Day, our mims, Palomino Entertainment, Victoria Racimo by Press Release. Bookmark the permalink.